Your Last Night To Grab Prizes At The Summer Fair! As some of you already know, the Summer Fair icon has now been removed off the map, but I’m here to tell you, you can still visit it, or at-least for tonight! Make sure you grab all your favourite prizes before the Summer Fair goes, probably tomorrow morning and we also have a secret scoop that very soon our nests will be getting updated! New to the Summer Fair… Prizes, Extra Tokens & Hidden Item! As an extra treat before we say farewell to the Summer Fair, a whole new load of stuff has been added and I know you’re going to love it. Lets start off with… extra tokens! When you play games at the Summer Fair, you can now earn bonus tokens which you can use to buy all sorts of prizes! Everyone gets double the amount of tokens! Bin Tycoons get triple the amount of tokens! Are you up for a search or a challenge? Listen up! Where can you usually get lost and can’t find your way back out?! This wallpaper is for Bin Tycoon members only, click here to become one and take part in extra fun at the Summer Fair! Have you heard? A huge stock of new items have landed at the Prize Hut at the Summer Fair, for one last time! Head over there and check out what’s new, and with those extra tokens that you can collect you’ll be able to get your hands on the prizes faster. NEW Bin The Ball Competition Winner! We would like to congratulate pinky141, who is the final Bin the Ball winner with their fantastically tricky design! I have to say, this is the hardest puzzle yet at the Bin the Ball stand, if you can make it to the middle you’re in for some BIG points! You can play this design in-game, at the Summer Fair now! New Carnival Cutouts At The Fun House And New Prizes! I was on my way to collect some tokens to spend at the prize booth, when I saw a Weevil arrive at the Summer Fair, I clicked the Weevil and it was Maybee! Maybee went inside the Fun House and I followed her into it and to my amazement, there’s some awesome Carnival Cutouts at the Summer Fair! It was quite funny, me and Maybee both went inside one. 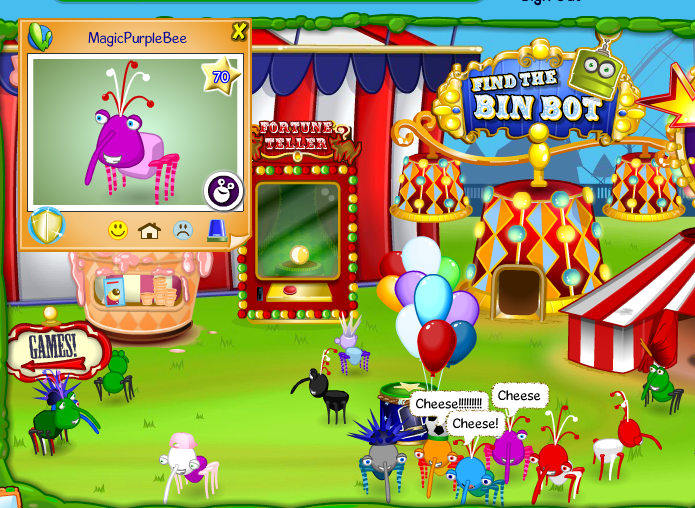 The Bin Weevils team have also released some Bin-tastic new prizes to the prize booth at the Summer Fair. Looks like you’ll have to start playing games like Gong’s Hammer and Duck Soaker to get enough tokens to buy the new items! I’m currently working on a Summer Fair nest room, then I’ll do A Look Inside post of my nest. P.S Don’t forget that on Saturday you can meet and greet the admins here at Bin Weevil Company, hf556 and Eddzy! Click here for the details. Summer Fair Mystery Door Now Open! A lot has happened in the Binscape while I’ve been away and I’m still trying to catch-up with it! It seems that a lot has happened at the Summer Fair and I would like to thank Tiny-Weevil and Eddzy for keeping the site updated. I do have to admit I am a bit disappointed with what is in the mystery door at the Fun House, but at-least it is now open for us all to go inside it. You will need 50 tokens when you go into the Mystery Door to spin the mystery wheel. 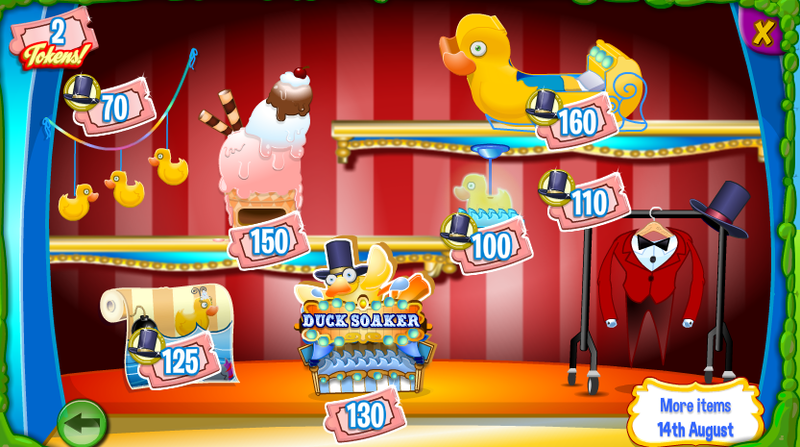 It’s a bit like Spin the Wheel game at the Summer Fair, but instead of earning tokens, you get duck replicas, which are featured in Duck Soaker. Please note: Bin Weevil Company apologize, but there won’t be a radio review today. Sorry for any inconvenience caused by this! Who’s next to Face Off at the Gunge Tent? We’ve had a two new arrivals… Tink and Clott… at the Gunge Tent recently but who would you like to face off there next? Cast your vote by clicking here and the choice with the most votes will appear in the Gunge Tent next – Bin-tastic! Super Antenna Gem And So Much More Coming Soon To The Summer Fair! Ever since the Super Antenna and Super Legs came to the Summer Fair, there’s been lots of talk about how we’re going to keep them after the Summer Fair, when we change our colour at the Weevil Changer. I think Bin Weevils have been listening and they are going to be releasing a Super Antenna Gem, which we can keep, even after the Summer Fair goes! With a Super Antenna Gem, you can go to your nest and click it and it will give you the Super Antenna! We actually are unsure whether this Super Antenna Gam is going to contain the Super Legs – we hope it does though! If you’ve read Tiny-King’s post the day before yesterday, you will notice that there’s some Bin-tastic new prizes out at the Summer Fair! Well, it seems as if Bin Weevils are going to be releasing even more brand-new nest items at the Summer Fair prize booth, any suggestions on what they might be? My Summer Fair room, which includes all of the nest items from the first set of prizes. I’ll soon be creating one with the new set of prizes! The Black and White room at the Bin Tycoon Fun House should also be opening very soon and I’m weevily excited! What do you think it could be? It seems that new Bin Weevil collectable characters will soon be coming to the Claw Machine at the Summer Fair and if you look at the image at the top post, you will agree with me that they look quite strange! They’re currently intriguing me. Guest Blogger: Summer Fair Reviews! Are you enjoying the Summer Fair so far? Do you want to get a blog post written by YOU featured on the What’s New Blog? Well you’re in luck! Send in a review of the Summer Fair, or a particular game or part of the Summer Fair that you particularly enjoy (such as Bin Pet Bounce, or the Fun House), and the best reviews will be chosen by Scribbles to be featured on the What’s New Blog! Send in your Guest Blogger reviews to blog@binweevils.com – we look forward to reading them!